Common questions and answers for six types of standardized, calibrated Gardco Viscosity Cups designed and produced by The Paul N. Gardner Company. All processors of liquid or semi-liquid materials are concerned with the ‘flow property’ of their products. This ‘flow property’, a sort of internal friction resisting flow, is measured as viscosity. Normally the amount of diluent in such products controls the viscosity of the product. Therefore, measuring viscosity is necessary not only to insure required and uniform product performance but also to control product cost. The fundamental unit of viscosity is the Poise. It is the force required to move one surface of a known area at a given velocity with respect to another surface when the two surfaces are separated by a viscous material. The Centipoise is the Poise divided by 100. The Stoke is the Poise divided by product density (or weight per gallon in pounds multiplied by 0.1202) and is the unit of measure when gravity is the force causing product flow. When the Stoke value is known, the equivalent Poise value may be found by multiplying the Stoke value by product density (or weight per gallon in pounds multiplied by 0.1202). The Centistoke is the Stoke divided by 100. There are many other specialty types of viscosity measuring instruments but they are beyond the scope of this writing. Most rotational instruments operate at more than one speed to permit a product to be evaluated at various rates of shear. They are, therefore, applicable to a higher level of product evaluation than viscosity cups. They are also applicable to the evaluation of materials containing a high ratio of solid materials and products that are above the range of instruments depending on gravity as a driving force. They are also expensive. Prices range depending on degree of sophistication, range, temperature control and data display. Measuring viscosity by the use of viscosity cups has become the preferred method for production control due to their ease of use, their rugged nature, recent improvements in accuracy and relatively low cost. Much confusion has resulted in the selection of, as well as the use of ,viscosity cups due to the number of types available and inadequate standardization between the various manufacturers. It is the purpose of the balance of this writing to present the most common questions asked and the answers to these questions. 1. Q. My company has just assigned me the responsibility of establishing a production control procedure for the measurement of viscosity. No such method exists at present. We are a small one plant company and our funds are quite limited. At present, we are not required to comply with such measurements from either suppliers or customers but this situation will probably change. It is understood that measurement by viscosity cup is probably the easiest way, and the lowest cost, to start such a program but which viscosity cup should I buy? A. The new EZ (Equivalent Zahn) Viscosity Cup is recommended. It is in the same price range as the Zahn Signature cup but it has the advantage of compliance with ASTM specifications which is most widely accepted by most users and you would be in a better position in the future, if, as you indicate, you might need to work with others. 2. Q. What is the difference between the EZ Cup and the Zahn Signature Cup? A. They are very similar in appearance and use. There are some design improvements in the EZ Cups not found in the Zahn Signature Cups but the main advantages are in compliance with ASTM specifications and in production procedures which permits closer tolerance to performance specification. EZ cups have a tolerance within 3%. Zahn Signature cup tolerance is within 5%. 3. Q. Associates, in situations similar to mine, tell me that they use the Zahn Signature Cups and they are well satisfied with their results. Should I decide on this cup, even though it does not meet ASTM specifications, can I be assured that this cup will continue to be available? A. Yes. The Paul N. Gardner Company is committed to making this cup available as long as there is a demand for it. In addition, conversion tables are available which convert results between the Zahn Signature and the EZ cups. Also, production procedures are being revised which will improve the uniformity of the Zahn Signature cups. Cups produced under this new procedure will be known as Zahn Signature Series 90 cups and they will comply with the flow characteristics of all earlier Zahn Signature cups that we have sold, but remember, they do not conform to that portion of the ASTM method which specifies drain time characteristics. 4. Q. Why did you not recommend the Ford Dip Cup? A. From your earlier question it was assumed that you were looking for the lowest cost possible. If your budget would tolerate about 75% greater equipment investment we would recommend this cup. It has the advantage of having a readily removable orifice with a flow path length greater than its diameter. This makes the cup more sensitive and accurate. It has the further advantage of providing results which are just one half those obtained with the Standard Ford Cup. This would be of considerable advantage if at a later time you established a formal laboratory and wanted to use the very popular Standard Ford cup in your laboratory work. Ford Cup tolerance is within 2%. Ford Cups are machined from solid aluminum bar stock. Ford Dip Cups have six easily removable , interchangeable orifices from size no. 0 to no. 5. If you wish just buy one cup and one or all of the orifices to fit it. This is a considerable cost saving. 5. Q. What about the Gardco/Fisher Cup? A. It is an excellent cup. It is also machined from solid aluminum bar stock and is produced with a removable orifice of appreciable length. It contains a larger volume than any of the other dip cups which gives it a significant accuracy advantage. It is also the most expensive, costing more than the EZ cup by a factor of about 2.5. 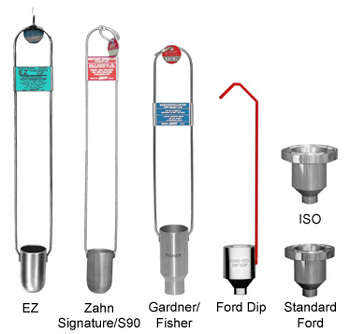 There would be little reason for standardizing on this cup unless you projected business with General Motors or one of its suppliers as it is not nearly as widely used as the Zahn Signature, EZ or Ford Dip Cup. Gardco/Fisher Cups have four easily removable, interchangeable orifices from size no. 1 to no. 4. If you wish just buy one cup and one or all of the orifices to fit. This saves considerable cost. 6. Q. So far you have not mentioned the ISO (International Standards Organization) Viscosity Cup. Would there be any advantage in my considering this cup? A. Not unless you contemplated future international business. It is a cup very similar in appearance and in use as the Standard Ford Cup but with different flow characteristics. This cup also has removable, interchangeable orifices. 7. Q. Which of the cup numbers (ranges) should I buy? A. It depends on the range of viscosity that you must consider. It may be helpful for you to know that over a half of the EZ and Zahn Signature Cups sold are #2. The very lightest materials require #1 and the heaviest, #5. 8. Q. How long does it take to make a viscosity measurement with the EZ Viscosity Cup? A. The recommended minimum is 1.5 times the number of seconds it takes water to drain from the cup or 10 seconds, whichever is greater. Below the 1.5 limit the measure is primarily turbulence at the orifice rather than viscosity. Below 10 seconds, errors in measuring drain time become too great. The maximum drain seconds recommended is 60. Since the exterior of the cup becomes coated with the test material, evaporation from the surface has a cooling effect on the contents and a possible hardening on the surface either of which may result in possible error. The minimum holds for all viscosity cups whether of the dip or laboratory ring stand type. The maximum is for dip cups only as the laboratory type, Standard Ford or ISO cups, do not become coated on the exterior. 9. Q. It sounds like the EZ or Zahn Cup would be the correct choice for my purposes so I would like to ask additional questions relating just to these two types. Just what is an EZ or Zahn Cup? A. These cups are formed from Stainless Steel. They are bullet shaped (cylindrical with a hemispherical bottom) with an orifice of specified size drilled in the exact center of the spherical base. Welded to the cup is a stainless steel wire loop extending twelve inches above the cup and terminating in a one inch ring. In use, the cup is held by the ring and is dipped into the material to be measured. As the cup is lifted from the material a timing device is started. The draining of the cup is observed and the timing device is stopped on the first break in the efflux stream about two inches below the base of the cup. Results are reported in efflux seconds. 10. Q. Is there more than one producer of the EZ Viscosity Cup? A. No. The EZ Viscosity Cup is produced only by the Paul N. Gardner Company. Production procedures followed by cup calibration results in drain time with a specified viscous material, traceable to the National Institute of Standards and Technology, being within 3% of target. 11. Q. Is there more than one producer of the Zahn Viscosity Cup? A. Yes. The Zahn Cup is produced not only by different suppliers in the United States but also in countries throughout the world such as England, France, Italy, and West Germany. However, The Paul N. Gardner Company is the only licensed producer by the inventor E. A. Zahn. 12. Q. Will Zahn Cups of the same orifice size number from different producers give the same readings on the same liquid? A. No. Differences exceeding 50% have been observed. 13. Q. How long have Zahn Viscosity Cups been in use? A. Zahn Viscosity Cups have gained rapidly in popularity since the last half of the 1940’s. Assuming that I proceed with the EZ Cup in my viscosity measuring program, I would like to proceed with questions relating to the cup accuracy, cup standardization, use and conditions under which viscosity measurements should be conducted. 14. Q. Just what is meant by cup accuracy? A. There are really two parts to this question and they are both important: Do cups from the same producer and of the same number agree from cup to cup as well as between cups purchased at a different time. The second part of the question relates to the cups providing long term consistent results and preferably that are related in some measurable way to fundamental units of viscosity. 15. Q. It appears to me that the second part of the answer on cup accuracy is most important since if I make a length measurement with a 12 inch ruler I assume that ruler is the same length as any other ruler that anyone else might use. What about viscosity cups? A. It is indeed a most important question and can be answered only for the cups produced by the Paul N. Gardner Company. A study was funded early in the 1980’s to study this problem. One of the findings of this study was the necessity to relate the cups to a standard superior to a dimensional drawing or a “standard” cup that a producer retained on the shelf. The answer was found in standard viscous materials . These materials are specified in units of Centistoke Viscosity with an accuracy to within 0.25% of label value and are traceable to the U.S. National Institute of Standards and Technology. These materials are used in the calibration of all viscosity cups produced by and are available from The Paul N. Gardner Company. 16. Q. What accuracy can I reasonably expect from any viscosity cup that I purchase from The Paul N. Gardner Company? This procedure not only insures that each cup within a given production lot falls within these tolerance limits but also, since the standard calibration oils are periodically renewed, that there is no long term drift away from the established standard. 17. Q. What should I look for in cups produced by others that might detract from cup accuracy or agreement between cups? A. This answer is limited to Zahn type cups only. Height to diameter of the cup as well as cup volume. Variance as much as 12% has been observed in cup volume. The cup is not welded to the support wire loop to hold the cup axis in symmetry with the support loop. This will cause the efflux stream to move away from the center of the orifice resulting in large error. Orifice diameter. Most producers have accurately copied the published diameter of the orifice. This is probably the greatest problem. Orifice diameter is the one physical dimension that can be adjusted to compensate for other cup variables. The orifice diameter of all cups produced by the Paul N. Gardner Company is adjusted to provide conformance with specified performance characteristics. The orifice is not in the exact center of the bottom of the cup. When this occurs, the efflux stream will “bend” to the lower portion of the orifice and large errors will result. The orifice is not round or uneven tooling marks are evident at either end of the orifice. Either condition detracts from cup accuracy. Variation in cup sidewall thickness. A variation as much as 50% has been observed. Since the orifice length is a function of sidewall thickness and orifice length is a direct factor in flow time, a variation in sidewall thickness is a serious condition. 18. Q. How does the orifice length influence drain time? A. The longer the orifice length the greater the drain time. Drain time is very roughly directly proportional to orifice length. 19. Q. How does the orifice diameter influence drain time? A. The greater the diameter of the orifice the shorter the drain time. The diameter of the orifice is very critical. Drain time is very roughly inversely proportional to the fourth power of the radius of the orifice. 20. Q. If I purchase the EZ Cup, can I convert readings from this cup to other cups produced by the Paul N. Gardner Company ? A. Yes. Since all such Gardco cups are calibrated through a mathematical formula to the common fundamental unit of viscosity measurement, the centistoke, any drain time in seconds from any particular cup can be converted not only to centistokes but also to any other Gardco cup where the conversion is within cup range. A wall size chart, 24" x 36", is available showing this conversion for each of the 29 cups making up the six types produced by the Paul N. Gardner Company. This conversion is in 5% steps throughout the range from 7.5 to 1387 centistokes. The conversion is very accurate as long as the material in question does not deviate greatly from a true liquid. The chart also contains other important information such as cup range, cup formula constants, standard oil used for calibration, cup sensitivity and standard cup use. 22. Q. Does the Zahn Signature cup meet the requirements of ASTM Method D-4212? A. No. The Zahn Signature Cups as originally licensed to the Paul N. Gardner Company fails only in meeting that portion of the method relating to drain time. However, in order to accommodate the thousands of Zahn Signature Cup owners who have established their records on the basis of these cups, they have now been standardized with mathematical formulas relating drain time to centistokes which permits converting their results to cups that do comply to ASTM Method D-4212. In addition, conversion tables are also available which convert results between the Zahn Signature and the EZ cups. 23. Q. Do the EZ cups meet the requirements of ASTM Method D-4212? A. Yes. This cup was designed specifically to meet the requirements of ASTM Method D-4212 in all respects. This step was taken to permit retention of the standard established for the Zahn Signature Series and also provide a similar series of cups of highest quality with improved design, standardized with compliance to D-4212. EZ cups have a tolerance within 3%. 24. Q. An acquaintance is bidding on a project which requires that his viscosity measuring equipment complies to MIL STD 45662A. What is this reference? A. MIL STD 45662A is a document which sets forth very specifically the procedures that must be followed in the certification of many types of testing equipment to an industry standard. Procedures that must be followed in certifying viscosity cups fall under this document. It includes the requirement of periodic evaluation of master thermometers and timing devices by the U.S. National Institute for Standards and Technology. It even includes setting down the environmental conditions under which certification procedures are conducted. It is the reason that standard viscous materials are used which are traceable to the U.S. National Institute for Standards and Technology. 25. Q. Is there a possibility that I would ever have to comply with MIL STD 45662A? A. If you ever contract with a government agency at any level and especially any arm of the Federal establishments, including the military, one of the requirements that will probably be imposed is that your measuring equipment must be certified in compliance with this document. 26. Q. Do your viscosity cups qualify for certification under MIL STD 45662A? A. Yes. Any viscosity cup produced by the Paul N. Gardner Company qualifies for certification under MIL STD 45662A and such certification is available as an extra cost service. 27. Q. Just what is this certification - what would I get? A. You would receive a certificate identifying you as the owner of a specific viscosity cup which would also be identified. Qualification for and conditions under certification would be listed. Actual results from the running of standard oils in your cup would be listed. These results include the target drain time for the oil used and the average from multiple drain time runs with your cup. The difference, if any, between the target drain time and that for your cup is included as a correction factor. The certificate is dated, signed by the technician doing the work and by his supervisor. 28. Q. Please outline for me the correct procedure for using a dip type viscosity cup. Insure that the product you are going to measure is at the specified measuring temperature, is well mixed and is free of air bubbles and that you have on hand the appropriate cup for the viscosity range in question. Inspect the cup and insure that it is clean, giving particular attention to the orifice area. Hold the ring at the top and immerse the cup in the material being measured so that the top edge of the cup is about a half inch below the liquid level. Quickly withdraw the cup from the test material and at the same time start a timing device. Carefully observe the efflux stream and at the first distinct break in the stream, one to two inches below the bottom of the cup, stop the timing device. Record the number of seconds drain time, temperature at time of measurement as well as cup type and number. Use the Gardco Viscosity Conversion Chart that accompanies each cup and convert seconds efflux time to centistokes viscosity if desired. 29. Q. Why should I hold the cup by the ring rather than the wire loop? 30. Q. What type of thermometer should I use to measure the temperature of the test material? A. Any type of thermometer that has rapid response and can be read to the nearest tenth of a degree Celsius or the nearest two tenths of a degree Fahrenheit. Where a high degree of accuracy is not required, bi-metallic thermometers which can be read to the nearest 1/2 degree Celsius or (1°F) may be used. 31. Q. What type of a timer should I use to measure drain time? A. Any type which will register to the nearest tenth second. The electronic digital type, registering to the nearest 1/100 second is gaining in popularity. 32. Q. Should I convert drain time seconds to centistokes in recording results? A. It depends on the end use of your data. If it is for internal comparative use only, such conversion may not be helpful. For any other purposes, it will probably be advisable to make the conversion. It can always be made at a later time. 33. Q. Is it best to take averages of several readings? A. Averaging several readings will reduce operator error. In all calibration and certification work at least three determinations are averaged. 34. Q. What care should be taken of the cup following use? A. It should be thoroughly cleaned unless it is to be immediately used to repeat readings with the same material. In any case do not expose the cup to air after use but place it back into the test material. Any drying of such materials on the cup surfaces will cause errors in following determinations or make the cup more difficult to clean. 35. Q. I have been hearing more and more about the importance of temperature control. Would you elaborate? A. Most of the reported problems in viscosity measurement relate to failure to control or to know the temperature of the material under question at time of measurement. Many materials display a very large change in viscosity as a function of relatively small change in temperature. A viscosity measurement is simply not meaningful unless the temperature at time of measurement is also known and recorded. Generally, the higher the viscosity the greater the change with respect to temperature. As an example, the standard oils used for cup calibration and certification change between 3% and 8% per degree Celsius, depending on the viscosity of the standard at normal use temperature. 36. Q. At what temperature should I make my measurements? A. It is customary to make viscosity measurements at 25 degrees Celsius which is 77 degrees Fahrenheit. However, measurements can be made at any other agreed on temperature. In some processes it is just not practical to measure at the customary temperature. But no matter what temperature is used it must be stated along with the viscosity determination. 37. Q. Is it important that the cup be at the same temperature as the product prior to a measurement. A. Yes. If it is not it will change the temperature of the product during the drain time. It is therefore good practice to measure temperature in the efflux stream. It is also good practice to place the cup in the material to be measured prior to the determination to insure that they are both at the desired temperature. Temperature control is easier if measurements are made in a draft free area which is as near as possible the same temperature as that at which measurements will be made. 38. Q. Is there any way that I can adjust measured drain time for a particular material to a target temperature? A. Within limits, yes. This can be done if the temperature index of the material is known. The temperature index is the percent change in viscosity per degree temperature in a given temperature range. The procedure for determining and using the temperature index for a given material is described in the long form product bulletins for viscosity cups produced by Gardco, the Paul N. Gardner Company. 39. Q. Can we try a viscosity cup and return it for a cup with another size orifice? A. Our policy is that once a cup has been sold we cannot accept its return either for credit or another size or type cup. Once a cup has been dipped into a material it is not possible to clean it and restore it to the perfect, new condition as when sold. Before ordering be sure you know what size orifice and which cup will suit your needs. 40. Q. Why shouldn’t I just report Zahn viscosity cup readings as seconds efflux time? A. Remember that there are many different makes of Zahn cups out there that can give you just as many different readings in seconds efflux time, so you can see that only reporting in seconds can many times be unmeaningful and very misleading. As an example, 40.0 seconds efflux in one make cup is 60.8 seconds in another make cup when measuring the same liquid at the same temperature. It is important for you to not only record the seconds efflux time but also it is now possible to determine the actual viscosity of the material by converting seconds to centistokes viscosity using your Gardco Cup Conversion Table. Then you have a meaningful basis of reference that can be relied on. We recommend that you also include the cup maker’s name in your report as well as temperature at time of test. As an example: 30.6 seconds, Gardco EZ Cup #2, 61.3 centistokes viscosity @ 77° F (25° C). Now you have recorded information that you can definitely rely on. 41. Q. How can I convert centipoises to centistokes? A. The centistoke is defined as the centipoise divided by density (or weight per gallon times 0.120). To convert, you must know the density or weight per gallon of the material. For example: you know the weight per gallon of the material is 9.5. Multiply 9.5 times 0.120 to find its density. Now assume that the material has a viscosity of 150 centipoises. 150 ÷ 1.14 = 132 centistokes. 42. Q. If I know the viscosity in centistokes (as an example is 132)and the weight per gallon of the material (i.e. 9.5) how do I convert to centipoises viscosity? 43. Q. I am using two new EZ#2 cups and each gives a different reading. One gives 17 seconds and the other is 20 seconds efflux time. Why are these readings so far apart? You should be using the #1 EZ cup instead of the #2 EZ cup. It should also be noted that if any of your work is below 10 centistokes the only cup type instrument that can be recommended is the Ford cup with the #0 orifice. 44. Q. My supplier tells me that I should buy a No. 2 Zahn Type Cup and my lacquer should run through this cup orifice within 20-24 seconds. Do you make such a cup? A. Your supplier has not given you enough information to answer your question. You should also know the makers name, shown on the nameplate. There are many different makes of Zahn Cups out there that can give you as many different readings which could lead to meaningless and misleading results. If it is a No. 2 EZ Cup with a Gardco or Paul N. Gardner Company nameplate you can then look at our No. 2 EZ Cup Conversion Grid which accompanies every Gardco cup and in this instance you will note the chart shows 20, 21, 22, 23 and 24 in the seconds column and the table shows that the equivalent viscosity in centistokes is 18.7, 23.2, 27.6, 31.9 and 36.1 centistokes; you now have been able to convert seconds efflux time into meaningful basic centistokes viscosity. With a Gardco made No. 2 EZ viscosity cup you not only know the seconds efflux time but now you know what the actual viscosity is in centistokes. You now have a solid foundation on which your results can be expressed. To our knowledge you can’t do this with any other make cups . The above listing of questions and answers covers the most important issues involved in the measurement of viscosity by the popular and widely used viscosity cups. They also cover the questions most frequently asked by our customers. Of course, there are many other questions that could be asked and it may be that some of the above answers need further clarification. In any case, the Paul N. Gardner Company stands ready to assist you in your problems of viscosity measurement, not only with the finest possible products but also with information that has been garnered in the design and manufacturing of these products.